Julius Edward Behnke was born on 12 June 1849 at Germany. He was the son of Gottlieb Behnke and Wilamena Sommervelt. Julius Edward Behnke married Kunigunda Schmidt on 28 April 1871 at Galena, Jo Daviess, Illinois. Julius Edward Behnke died on 8 February 1932 at Minnehaha, South Dakota, at age 82. Married Name 28 April 1871 As of 28 April 1871,her married name was Behnke. Kunigunda Schmidt was born on 10 October 1852 at Germany. She married Julius Edward Behnke, son of Gottlieb Behnke and Wilamena Sommervelt, on 28 April 1871 at Galena, Jo Daviess, Illinois. Kunigunda Schmidt died on 10 September 1912 at Alcestor, Union, South Dakota, at age 59. Gottlieb Behnke married Wilamena Sommervelt. Gottlieb Behnke was born on 18 September 1819 at Prussia. He died on 23 January 1900 at Dubuque, Iowa, at age 80. Name Variation Wilamena Sommervelt was also known as Minnie. Married Name Her married name was Behnke. Wilamena Sommervelt married Gottlieb Behnke. Wilamena Sommervelt was born on 20 September 1821 at Germany. She died on 15 February 1884 at Dubuque, Iowa, at age 62. Forest Burris married Louise Skow. Married Name Her married name was Burris. Louise Skow married Forest Burris. (?) Sanders married Grace Margaret Muntz, daughter of Arnold S. Muntz and Maud Appolonia Rupp, before 2006. Raymond James Miller was born on 16 August 1920 at Iowa. He married Jannan Martha Muntz, daughter of Arnold S. Muntz and Maud Appolonia Rupp, on 5 June 1948 Jannan Muntz and Raymond Miller engagement and marriage announcements. Raymond James Miller died on 9 January 1990 at Iowa at age 69. David Nicholas Walech was born on 5 September 1930 at Dubuque, Dubuque, Iowa. She was the daughter of Nicholas Walech and Genevieve Gertrude Rupp. David Nicholas Walech died on 18 July 2001 at Rochester, Olmsted, Minnesota, at age 70. [S373] U.S. Federal Census 1940 U.S. Federal Census, by Ancestry.com, Year: 1940; Census Place: Dubuque, Dubuque, Iowa; Roll: T627_1158; Page: 10A; Enumeration District: 31-38. Andrew Bode was born on 12 April 1875 at Dickeyville, Grant, Wisconsin. He was the son of Joseph Bode and Anna Weber. Andrew Bode married Bertha E. Duve, daughter of Bernard John Duve and Anna B. Richter, circa 1914. Andrew Bode died on 23 January 1951 at Dubuque, Dubuque, Iowa, at age 75 Andrew Bode obituary. He was buried after 23 January 1951 at Saint Andrews Cemetery, Potosi, Grant, Wisconsin. Name Variation Andrew Vondrum was also known as Voudrum. Name Variation Andrew Vondrum was also known as Vondran. Andrew Vondrum was born on 28 August 1880 at Wisconsin. He was the son of Joseph Vondran and Mary Anna Brandt. 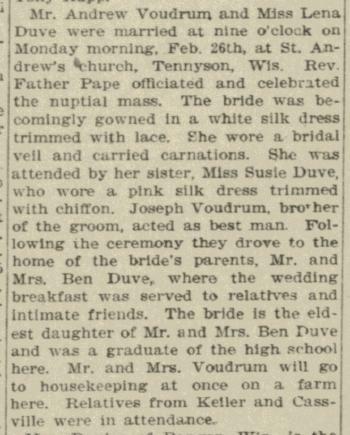 Andrew Vondrum married Helena Gertrude Duve, daughter of Bernard John Duve and Anna B. Richter, on 26 February 1906 Lena Duve and Andrew Voudrum (Vondran) marriage announcement. Andrew Vondrum died on 3 March 1964 at Wisconsin at age 83 Andrew Vondrum obituary. He was buried after 3 March 1964 at Saint Charles Catholic Church Cemetery, Cassville, Grant, Wisconsin. In October 1953 article: 5 generations starting with Anna (Richter) Duve. Leo Bernhard Leeser was born on 25 April 1878 at Grant, Wisconsin, also reported 25 Apr 1877. He was the son of Joseph Leeser and Anna Marie Burggraf. Leo Bernhard Leeser married Dora Amelia Duve, daughter of Bernard John Duve and Anna B. Richter, in May 1906 Leo Leeser and Dora Duve marriage announcement. Leo Bernhard Leeser died in 1957. Charles Simon Flesch was born on 18 February 1883 at Grant, Wisconsin. He married Mary Caroline Duve, daughter of Bernard John Duve and Anna B. Richter, on 28 June 1910. Charles Simon Flesch died on 26 May 1940 at Wisconsin at age 57. 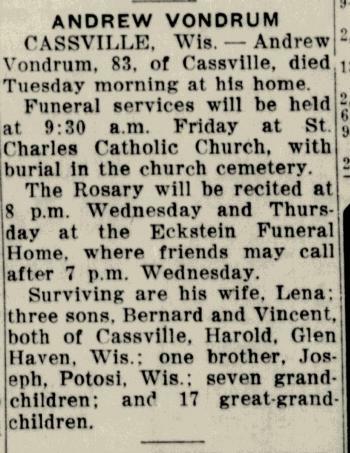 He was buried after 26 May 1940 at Saint Phillips Catholic Cemetery, Rolling Ground, Crawford, Wisconsin. Henry Joseph Klein was born on 30 August 1880 at Grant, Wisconsin. He was the son of Joseph Klein and Emma Frances Kehrer. Henry Joseph Klein married Matilda Mary Duve, daughter of Bernard John Duve and Anna B. Richter, on 22 October 1912. Henry Joseph Klein died on 8 October 1960 at Grant, Wisconsin, at age 80. 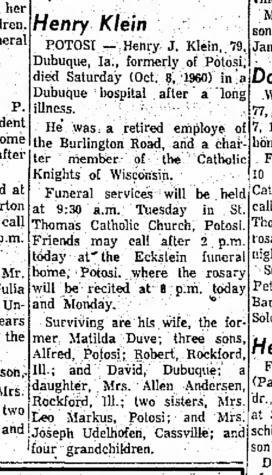 He was buried after 8 October 1960 at Saint Thomas Cemetery, Potosi, Grant, Wisconsin. Adolph Joseph Brandt was born on 24 March 1892 at Kieler, Grant, Wisconsin. Adolph Joseph Brandt was the best man at the wedding of Fred Schmieder Sr. and Margaret B. Brandt in September 1912 at Kieler, Grant, Wisconsin; Margaret Brandt and Fred Schneider marriage announcement. 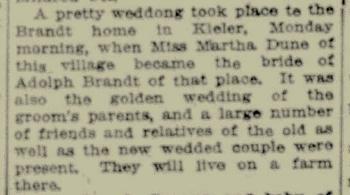 Adolph Joseph Brandt married Martha M. Duve, daughter of Bernard John Duve and Anna B. Richter, on 25 June 1917 at Kieler, Grant, Wisconsin, Martha Duve and Adolph Brandt marriage announcement and celebration of his parents, Mr and Mrs Silas Brandt, 50th wedding anniversary. Adolph Joseph Brandt died in April 1952 at Kieler, Grant, Wisconsin, at age 60 Adolph Joseph Brandt obituary. 1 June 1905 Jamestown, Grant, Wisconsin Adolph Joseph Brandt appeared on the census of 1 June 1905 in the household of Cyralus John Brandt at Jamestown, Grant, Wisconsin. 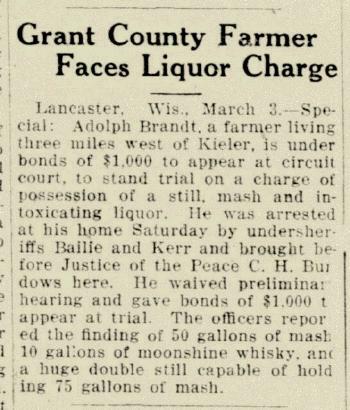 In March 1926 at Grant, Wisconsin, Adolph Brandt arrested on liquor charge for possession of a still, mash and intoxicating liquor. Virgil B. Brandt married Elaine F. Oftedahl. Virgil B. Brandt was born on 31 July 1918 at Wisconsin. He was the son of Adolph Joseph Brandt and Martha M. Duve. 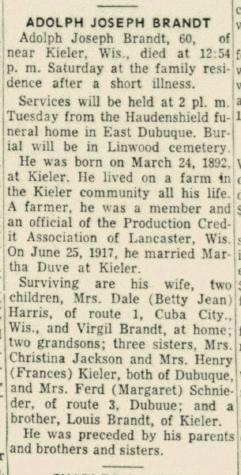 Virgil B. Brandt was the best man at the wedding of Dale Harris and Betty Jean Brandt in July 1946 at Dickeyville, Grant, Wisconsin; Betty Jean Brandt and Dale Harris marriage announcement. Virgil B. Brandt died on 27 May 1992 at age 73. He was buried after 27 May 1992 at Linwood Cemetery, Dubuque, Dubuque, Iowa. Married Name July 1946 As of July 1946,her married name was Harris. Betty Jean Brandt was born in 1923 at Wisconsin. She was the daughter of Adolph Joseph Brandt and Martha M. Duve. 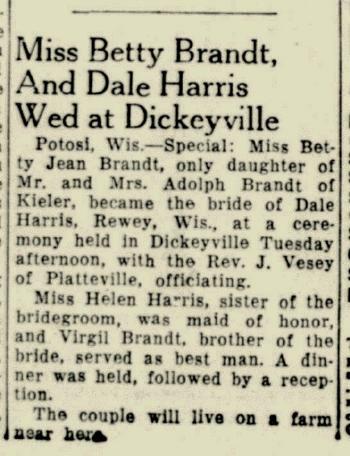 Betty Jean Brandt married Dale Harris in July 1946 at Dickeyville, Grant, Wisconsin, Betty Jean Brandt and Dale Harris marriage announcement. Betty Jean Brandt was buried in 1979 at Mount Pleasant Cemetery, Cuba City, Grant, Wisconsin. Name Variation Katharine A. Brandt was also known as Katie A. Married Name Her married name was Grimm. Name Variation Katharine A. Brandt was also known as Catherine. Katharine A. Brandt married (?) Grimm. Katharine A. Brandt was born on 16 January 1890 at Kieler, Grant, Wisconsin. 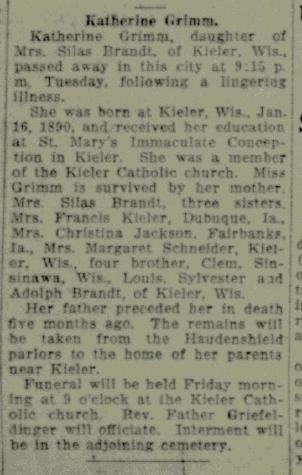 Katharine A. Brandt died in May 1920 at Dubuque, Iowa, at age 30 Katherine (Brandt) Grimm obituary. 1 June 1905 Jamestown, Grant, Wisconsin Katharine A. Brandt appeared on the census of 1 June 1905 in the household of Cyralus John Brandt at Jamestown, Grant, Wisconsin. Name Variation Christina L. Brandt was also known as Tena. Married Name May 1911 As of May 1911,her married name was Jackson. Christina L. Brandt was born in May 1888 at Wisconsin also reported as May 1883. 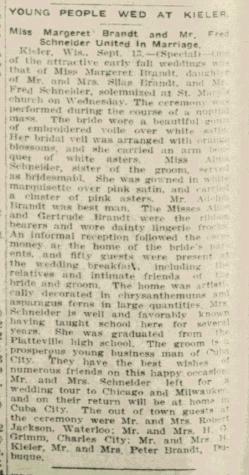 Christina L. Brandt was a bridesmaid at the wedding of Anna Manemann and Clements Edward Brandt in June 1905 at Sinsinawa, Wisconsin; Anna Manemann and Clement Brandt marriage announcement. Christina L. Brandt married Robert C. Jackson in May 1911 Christina Brandt and Robert Jackson marriage announcement. Christina L. Brandt died after 1960. 1 June 1905 Jamestown, Grant, Wisconsin Christina L. Brandt appeared on the census of 1 June 1905 in the household of Cyralus John Brandt at Jamestown, Grant, Wisconsin. Married Name September 1912 As of September 1912,her married name was Schmieder. Married Name September 1912 As of September 1912,her married name was Schneider. Margaret B. Brandt was born on 4 December 1887 at Wisconsin. Margaret B. Brandt married Fred Schmieder Sr. in September 1912 at Kieler, Grant, Wisconsin, Margaret Brandt and Fred Schneider marriage announcement. Margaret B. Brandt witnessed the death of Appolonia Bishop on 11 November 1931 at Kieler, Grant, Wisconsin; Appolonia (Bishop) Brandt obituary. Margaret B. Brandt died in July 1979 at age 91. 1 June 1905 Jamestown, Grant, Wisconsin Margaret B. Brandt appeared on the census of 1 June 1905 in the household of Cyralus John Brandt at Jamestown, Grant, Wisconsin. Name Variation Fred Schmieder Sr. was also known as Schneider. Fred Schmieder Sr. was born circa 1891 at Wisconsin. 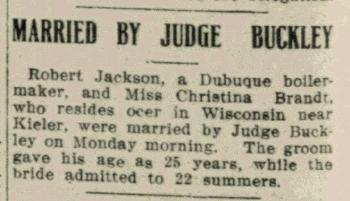 He married Margaret B. Brandt, daughter of Cyralus John Brandt and Appolonia Bishop, in September 1912 at Kieler, Grant, Wisconsin, Margaret Brandt and Fred Schneider marriage announcement. Name Variation Clements Edward Brandt was also known as Clem. Name Variation Clements Edward Brandt was also known as Clement Edward. Name Variation Clements Edward Brandt was also known as C. E.
Clements Edward Brandt was born on 26 June 1870 at Grant, Wisconsin, also reported as July 1870. 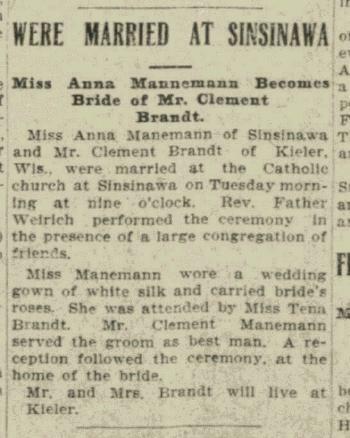 Clements Edward Brandt married Anna Manemann, daughter of John Clemens Manemann and Anna Christina Uhlen, in June 1905 at Sinsinawa, Wisconsin, Anna Manemann and Clement Brandt marriage announcement. Clements Edward Brandt died in August 1951 at age 81 Clement Edward Brandt obituary. In June 1930 at Kieler, Grant, Wisconsin, Clem and Anna (Manemann) Brandt 25th wedding anniversary celebration. Mary Appolonia Brandt was born in January 1878 at Wisconsin. Mary Appolonia Brandt was a bridesmaid at the wedding of Frances Brandt and Henry John Kieler on 28 May 1902 at Kieler, Grant, Wisconsin; Frances Brandt and Henry Kieler marriage announcement. Mary Appolonia Brandt died before 1931. Married Name Her married name was Brohof. Married Name Her married name was Brahof. Adalade (?) married Frank Bishop. Adalade (?) was born in December 1818 at Germany. Adalade (?) had 5 with 5 living in 1900 children. Name Variation Frank Bishop was also known as Johann Franz Bischoff. Name Variation Frank Bishop was also known as Brahof. Name Variation Frank Bishop was also known as Brohof. Frank Bishop married Adalade (?). Frank Bishop was born on 6 July 1816 at Huethen, Prussia. 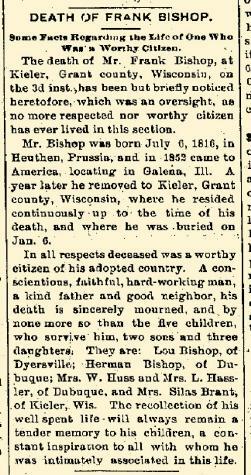 He died on 3 January 1896 at Grant, Wisconsin, at age 79 Frank Bishop obituary. Frank Bishop immigrated in 1852. Henry Brandt was born in December 1879 at Cassville, Grant, Wisconsin. He was the son of Clemens Brandt and Anna Barbara Wilhelmina Bischoff. 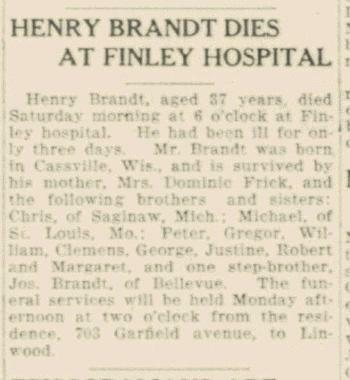 Henry Brandt died in May 1917 at Finley Hospital at age 37 Henry Brandt obituary. [S246] U.S. Federal Census 1880 U.S. Federal Census, by Ancestry.com, Year: 1880; Census Place: Jamestown, Grant, Wisconsin; Roll: 1427; Family History Film: 1255427; Page: 162A; Enumeration District: 110; . [S245] U.S. Federal Census 1900 U.S. Federal Census, by Ancestry.com, Year: 1900; Census Place: Julien, Dubuque, Iowa; Roll: 430; Page: 15A; Enumeration District: 0115; FHL microfilm: 1240430. Michael Leo Brandt was born on 1 September 1888 at Dubuque, Iowa. As of 1947, Michael Leo Brandt was never married. He died on 20 May 1947 at Moline, Rock Island, Illinois, at age 58. Name Variation Clemens Brandt was also known as Clemenz. Clemens Brandt was born in September 1890 at Iowa. George Brandt was born in August 1892 at Iowa. George Brandt married Mary Rooney, daughter of J. C. Rooney and Margaret McAughey, before 1921. Justin Brandt was born in January 1896 at Iowa. Justin Brandt married Lillian Plein, daughter of John Plein and Anna Meyer, before 1920.